Jewelry and accessories inspired by childhood memories and whimsical fun! Happy Thanksgiving! Two days late! I've been using my time off the past few days to work on a completely new technique. For me anyway. 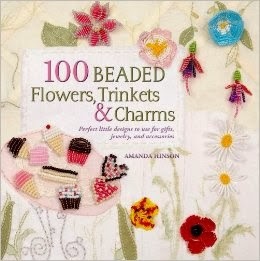 Perhaps somewhere out there, someone else is making beads in this same way, but for me, it's completely new. And I stumbled upon it by accident, which is always exciting! Right now I'm still perfecting my method, so to speak, but I hope to have some jewelry using these beads posted in my shop soon! It's quite a detailed process, but the finished beads are turning out so awesome! I love that it's giving me a chance to use some of my decorative, scrapbook, and handmade papers for my jewelry! I've also had my eye on some of the K&Co Amy Butler papers for these as well. So many possibilities for these little treasures! And now I'm off for more creating! I hope you all have a lovely fall weekend filled with apples and caramel dip, and crunchy leaves under your feet! I've been having such a wonderful school year, and can't believe how the time is flying by! Halloween is already over? It can't be! I'm very busy these days working on orders, trying out new techniques, and making new items for my shop! 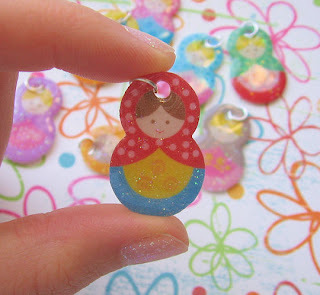 First off, I have some little 1 1/8" Matryoshka doll charms that were just added today. Very fun and glittery! I also have some new foodie themed charms to add! This is my favorite! 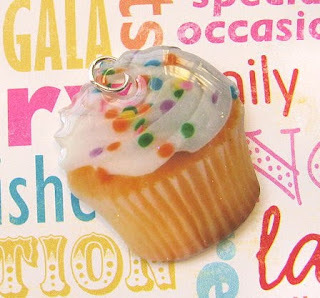 A sweet little 1 1/8" tall cupcake charm! It looks so real it makes my mouth water! This is just the beginning of a new line of acrylic charms I'm working on. I didn't get the Halloween charms finished in time to add to my shop, but definately look for some cute little Christmas charms soon! Hello and welcome! This is where you can find my ramblings about beading, Disney, my shop, and life in general!